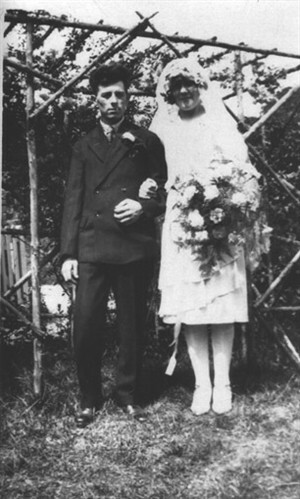 A pretty wedding was solemnized (at St Mary's, Stoughton on 5 August 1929) on August Bank Holiday at the picturesque village of Stoughton, nestling among the South Downs. The bride who was given away by her father, looked charming in a dress of white Milanese. Her veil of white embroidered net was surmounted by a coronet of orange blossom and silver, and she carried a bouquet of carnations and foliage. Her only jewellery was a sapphire and diamond pendant, the gift of the bridgegroom. The bridesmaids Misses Edie, Pat and Fay (Frances) Lillywhite (sisters of the bride) and Miss Winnie Russell (friend of the bride). They were prettily dressed in powder blue ray de chine, trimmed with dainty lace. Wreaths of silver leaves adorned their heads, and they carried bouquet of pink roses. Their gold initialled wristlets were gifts from the bridgegroom. Mr John Hunter (friend of the bridegroom) carried out the duties of best man. Numerous friends and relations gathered at the bride's home for the reception. The bride's going away dress was of crushed strawberry chenille, with a chocolate brown hat and coat. The happy couple received numerous presents. This page was added on 16/03/2006. The Rootschat website (Sussex section) has a lot about the Brighton Tucknotts, including those that returned after emigrating to Canada and one who once worked for the Brighton Loco works and lived to be 101. I was interested to read about your parents' wedding as I am looking at weddings during the 1929-39 period. Do you know where your mother got her wedding dress from? Hi Beryl I have just found your very interesting pages on the internet and I am pretty sure you must be my 3rd cousin once removed. Many thanks for making contact, it's always good to hear from relations. Could I ask are you decended from the Speed or Lillywhite branch of the family and which family member connects me to you? I very much look forward to your reply.